John Wycliffe and the Dawn of the Reformation. Home » John Wycliffe and the Dawn of the Reformation. John Wycliffe on his sick bed assailed by the friars at Oxford in 1375. From the picture by George Thomas. John Wycliffe (1330-1384) and the Dawn of the Reformation. During the reign of Edward III a silent alteration had been wrought in the condition of the lower classes. Feudalism was beginnings its slow decline, the divisions in the state made by contending parties, the divisions in the church made by contending popes, and a general upheaving of society, followed or preceded those political agitations, which, though they appeared to be confined to the barons and chiefs of houses, yet involved the common people, and still more the burgesses, who had already attained to some political power in parliament. Wycliffe first rose into prominence by his courageous denunciations of the mendicant friars with whom England was at that time swarming. He declared that they interfered with the duties of the settled priesthood. He denounced all the orders, the higher as hypocrites, who,in spite of their professions of poverty and affectation of beggary, fared sumptuously, dwelt in grand houses, and lived in the luxury of wealth; the lower kind as common able-bodied vagabonds and idle saunterers. The opinions of this early reformer advanced so rapidly, that though he did not altogether separate himself from the Roman Catholic communion, he began by questioning the polity of Romanism and eventually declared its theology to be erroneous. 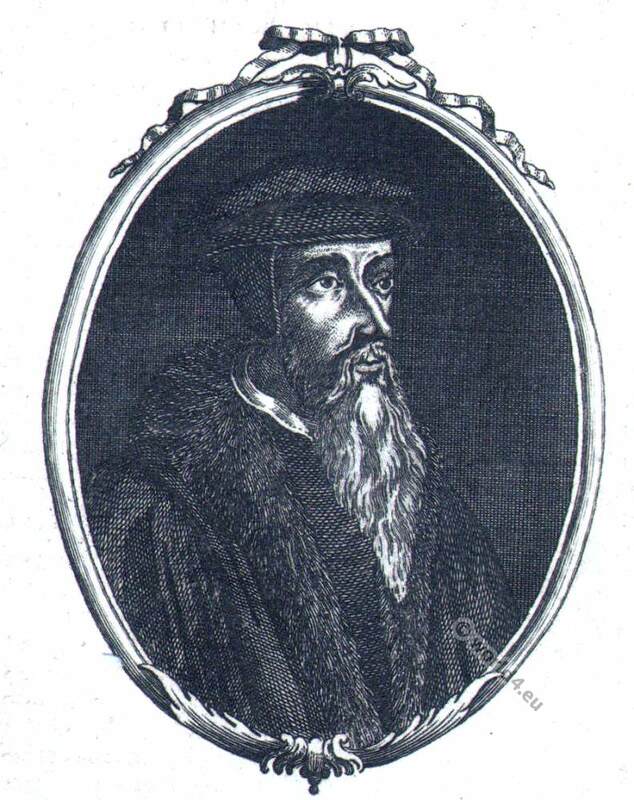 John Calvin 1509-1564 was a reformer of French descent and founder of Calvinism. He is considered a representative of a kerygmatic theology. He has been compared to Calvin, with the difference that he was broader and more liberal indoctrine,— the whole system of the hierarchy he regarded as the result of priestly ambition, the first step being the distinction between bishop and presbyter, which he declared was an innovation on the practice of the primitive church, where all were equal. He was for disestablishment and disendowment, asserting that pastors should depend on the free offerings of their flocks. He himself was a missionary preacher, and his followers, whom he called “poor priests,” were directed to go and preach, as it was the sublimest work; but at the same time they were not to imitate the priests, who after the sermon were to be seen sitting in the ale-houses, or at the gaming table, or wasting their time in hunting. After their sermon was ended they were to visit the sick, the aged, the poor, the blind and the lame, and succour them according to their ability. A century after Wycliffe’s death his doctrine—expounded in numberless manuscripts, and its freedom aided by the Scriptures, of which he had produced a version for the common people—revived in the Lollards, who themselves survived persecution and eventually succeeded in establishing the supremacy of Protestantism. 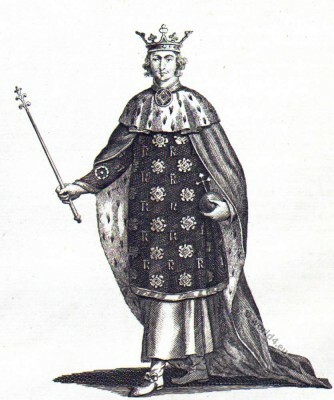 EDWARD II., called Edward of Caernarfon. He was born at Carnavon in Wales April, 25. 1284. Edward was the first King of England`s eldest son, that had the title of Prince of Wales, which he was made 1300. He offended the throne July, 7. 1307- was obliged by the barons to invest the Government of the Kingdom in 21 Persons, March, 16. 1310. Dethroned, Jan. 13. 1327. And was murdered at Berkley Castle, Sept. 21. following. John Wycliffe was born during the reign of Edward II., in the year 1324, at the village of Wycliffe in the valley of the Tees, and in the North Riding of Yorkshire. His family, which was a good one, had long resided in those parts, and he was sent about the age of sixteen to Oxford. At that time Oxford was a great place of resort, and thousands, not only from all quarters at home, but from abroad, pursued their studies there. Among the professors it may suffice to mention Bradwardine, who was drawing to the close of a brilliant career as an astronomer, a mathematician, and a teacher of religion, when Wycliffe entered. Of our young student’s course at the university not much is known, but he went through the usual curriculum, and eventually became a fellow of his college, that of Merton. 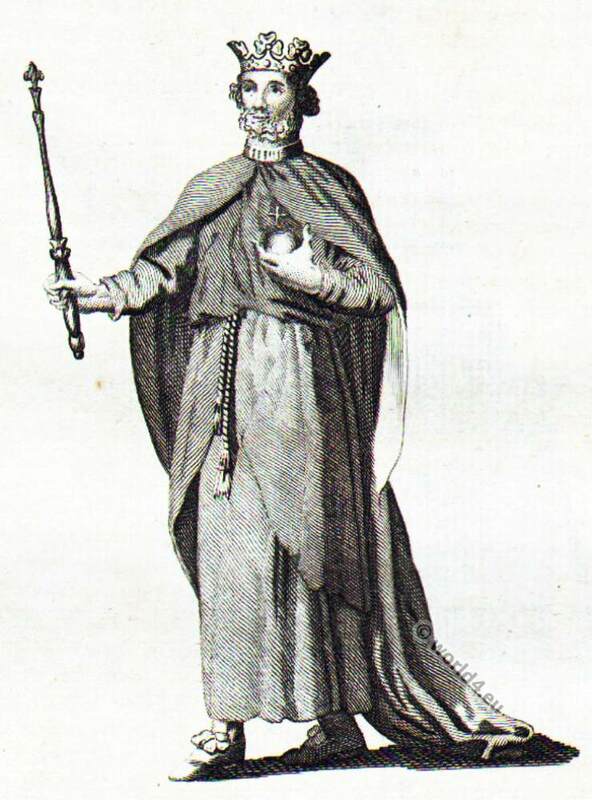 By the time he had reached the age of thirty-two he appears to have commenced his crusade against the ecclesiastical corruptions of his day; and in 1360 he distinguished himself by his activity in opposing the encroachments of the mendicant friars. In 1361 he was appointed master of Balliol College, in which capacity he was authorized to give public lectures on the Scriptures. Soon after, he was presented to the living of Fillingham, which he subsequently exchanged for another. In 1365 he was made Warden of Canterbury Hall, a new college founded at Oxford by Simon de Islip. By its constitution the fellowships of this college were to be held by four monks and eight secular priests, but the rivalry which sprang up between them led the founder to dismiss the monks, to substitute priests for them, and to make Wycliffe the warden or master. Ere long Islip died, and Langham, his successor, restored the monks and dismissed Wycliffe, who appealed to the pope, but who, after three years of waiting, found that the decision was given against him. In the meantime Wycliffe had been brought into greater prominence. Many years before, the pope had exacted an annual tribute of a thousand marks from King John, but in course of time the payment had been quietly discontinued. In 1365 Urban V. made a demand for the annual tribute and all arrears, and intimated that if Edward III. failed to comply he would be summoned to Rome, there to appear before his lord the pope and answer for his contumacy. Instead of submitting, the king summoned parliament, laid the pope’s missive before the house, and bade it consider and say what reply should go back. The parliament decided not to pay the money. The pontiff, however, had his supporters, and a monk who undertook to be his champion challenged Wycliffe to dispute the question. The challenge was accepted, the papal claims were powerfully resisted, and the English nation paid no more tribute to Rome, a result which was very acceptable not only to the people, but to the king himself. Edward III., (1312-1377) came from the dynasty of Anjou-Plantagenet and began his reign Jan. 13. 1327 to June 21. 1377. Edward III., was King of England and Wales and is considered one of the most important English rulers of the Middle Ages. Engraved for BARNARD`S New Complete & Authentic History of England. In 1372 Wycliffe became Doctor of Divinity, and as such was authorized to open his own school as a public teacher of theology in the university. The quarrel with the pope was not yet over, however, and was no longer confined to the question of tribute, but extended to other matters, which gravely affected the rights of the crown and the property of the nation. The Papal see reserved to itself a goodly number of wealthy benefices in England, and presented to themItalians and other foreigners. In 1373 the king sent commissioners to the pope, Gregory XI., to complain and seek redress, but to no purpose. The next year, a royal commission was appointed to estimate -the number and value of the ecclesiastical posts occupied in this country by foreigners. Negotiations with the pope were renewed, and Wycliffe was one of the commissioners sent out as delegates. They met at Bruges, and after two years an unsatisfactory compromise was come to. During these two years Wycliffe remained abroad, and soon after his return was made rector of Lutterworth. In February, 1377, convocation met, and summoned him to appear and answer the charge of holding and publishing erroneous and heretical opinions. Courtney, the new Bishop of London, was a leader in this business. The reformer, as we may now call Wycliffe, answered the summons, and presented himself at St. Paul’s before the reverend assembly. Not alone, however, for he was attended by John of Gaunt, Duke of Lancaster, and Lord Percy the earl-marshal. 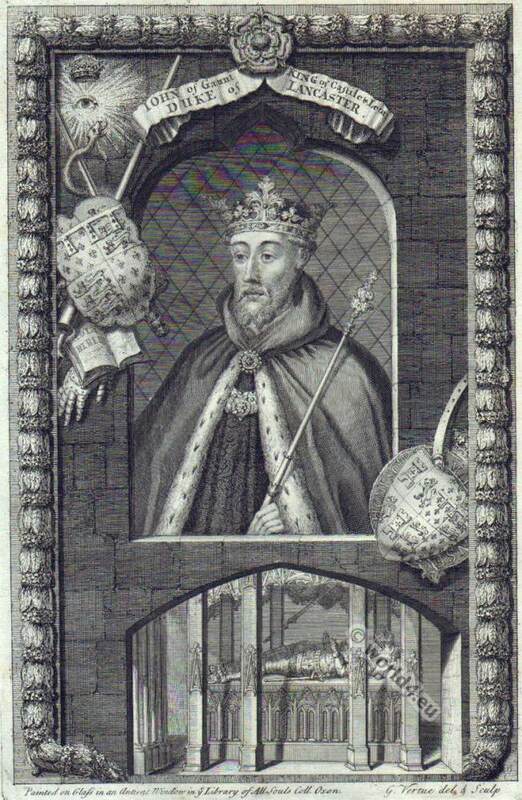 John of Gaunt, 1. Duke of Lancaster (1340-1399), came from the originally French aristocratic family of Anjou-Plantagenet, which provided since 1154 with Henry II. the English kings. He was the third surviving son of King Edward III. of England (1312-1377) and his wife Philippa of Hainault (1311-1369). He was the progenitor of the House of Lancaster. His older brother was Edward of Woodstock (1330-1376), who was called just “the Black Prince” because of his black armor. There was a vast crowd eager to see what happened, and an altercation ensued between Wycliffe’s friends and the bishop. Some of the harsh words which fell from the duke excited popular feeling, confusion ensued, and nothing was done. Great riots took place out of doors, but they were soon suppressed, and settled no controversy. A few months later Edward III. 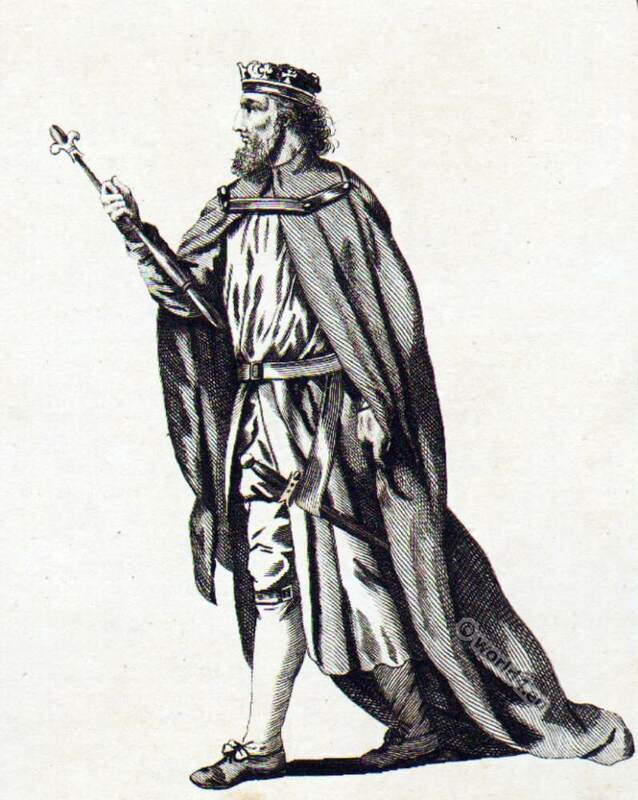 died, and was succeeded by Richard II., whose first parliament inherited the national spirit of opposition to the Roman see, which, by taking out money and sending in men and dictates, seemed at once to attack the liberties and the prosperity of the country. About this time the pope wrote letters against Wycliffe to the king, the Archbishop of Canterbury, and the University of Oxford, requiring immediate steps to ascertain his opinions, to condemn them so far as heretical or erroneous, and to prevent their diffusion. The university hesitated, but the clergy were prompt, and the archbishop wrote to the chancellor of Oxford, ordering him to proceed. As a result, early in 1378 Wycliffe appeared at Lambeth, and alone, before a synod; but though alone, the support outside was great and significant, for crowds were assembled to proclaim their zeal for him and for his doctrine. The situation was not a pleasant one for the ecclesiastics; and while they pondered, Sir Lewis Clifford entered, and, in the name of the queen-mother, forbade them to pronounce any definite sentence. The pliable synod discreetly, not to say timidly, succumbed, after receiving a statement and explanation from the reformer, and bidding him to abstain from teaching such doctrines. 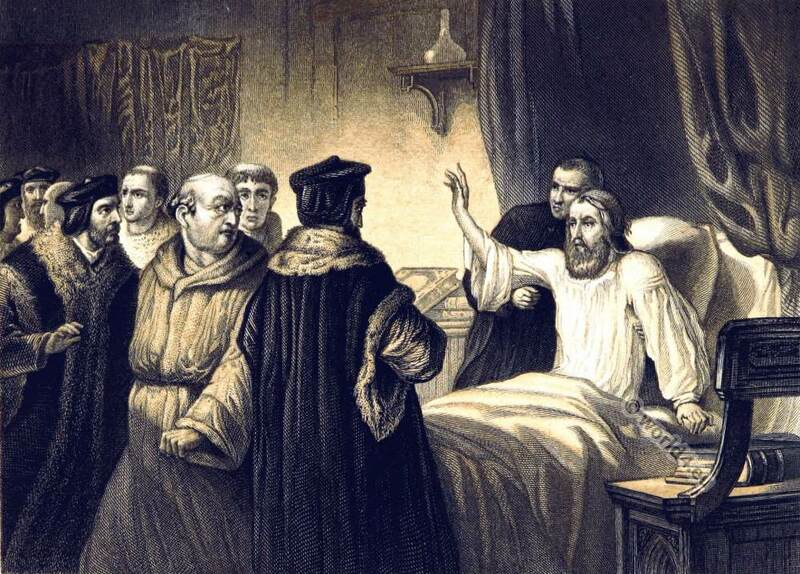 It was a narrow escape, but it was a decided one, for although the clergy expressed their disapproval, they could not proceed to deal with the liberty and life of Wycliffe as they desired to do. Nor must we omit to observe that an order to be silent on certain topics supplied a new reason and greater leisure for the employment of the pen. How actively and successfully the reformer wielded his literary power is known by the number and amazing diffusion of his books and doctrines at home and abroad. By his writings alone he did much to bridge over the interval between himself and Luther. It may be worth noting that the greater part of his voluminous works seem to have been written during the last eight or ten years of his life, and included the famous translation of the Scriptures out of Latin into English. The effects of this version, especially the New Testament portion of it, were very remarkable in the development of liberty of conscience. In a dangerous illness which befell Wycliffe about 1379, he being then at Oxford, it was hoped that he might be persuaded to recant. Four friars and four civilians who held office in the city were deputed to wait upon him as he lay on his sick-bed. They began with some expressions of sympathy and hope of returning health. Then they referred to the many injuries which the mendicant friars had received at his hands, and hinted that as death was approaching they trusted he would not conceal his penitence, but revoke all he had said against them. The sick man heard them out, and then, beckoning to his attendants to raise him in bed, and fixing his eyes upon his visitors, he exclaimed with all the energy he could command, “I shall not die, but live; and shall again declare the evil deeds of the friars.” The intruders glanced confusedly at each other, and retreated in disappointment and dismay. He did live, and he fulfilled his promise. The boldness of Wycliffe in assailing various doctrines and practices of the Roman Church could not be ignored; and in a convention at Oxford, consisting of twelve doctors, eight of whom were monks or begging friars, several of his opinions were condemned in his absence. The decision was brought to him while he was lecturing. He complained of the course which had been taken, and challenged his opponents to refute him in fair discussion. This they did not want, and he resolved to appeal to the civil power. One consolation remained, for though he could not teach at Oxford in consequence of this decision, he could preach and write at Lutterworth. The next year Courtney, who was now Archbishop of Canterbury, convoked a synod in London to consider the new doctrines. Soon after the assembly met an earthquake occurred, and greatly alarmed many of the members, but eventually certain opinions were condemned as heretical or erroneous. Every attempt was made to give effect to this decision. The clerical party laid their complaints before the young king, Richard II., and his court, and this was at a time when political affairs were in a critical state, and when the alliance of the clergy might be useful. As a result, a proclamation was sanctioned by the king and some of the lords,— the first proclamation in English history for the punishment of heresy. The document was not sanctioned by parliament, but it was more or less acted upon. Richard II., was born Jan. 6. 1367. Succeeded to the crown June 21. 1377. Resigned his Crown Sept. 29.1399. Was murdered in Pomfret Castle Jan. 1400 and buried at Langley but afterwards removed to Westminster. Richards parents were Edward of Woodstock, Prince of Wales (the posterity as the “Black Prince” known), and Joan of Kent (The Fair Maid of Kent). Richard II. Is the eponymous protagonist of William Shakespeare’s Richard II. Wycliffe was not abashed, and in November, 1381, he boldly laid his complaint before the king and parliament. The parliament in its turn petitioned the king to withdraw the persecuting statute. This was at Oxford, where also convocation assembled at the same time, and summoned Wycliffe to appear. He obeyed, and presented his confession of faith, but the only direct result seems to have been a further limitation of his freedom of speech. In 1415 the Council of Constance, though very busy in condemning the wretched Pope John XXIII., found time to decree that John Wycliffe was a heretic, and that his bones should be dug up and burned. The English were not in a hurry to do so silly and spiteful a thing, but in 1428 Pope Martin V. ordered the Bishop of London to see that the sentence was executed. So the grave was opened, the bones were taken out and burned, and the ashes were thrown into the stream which runs near Lutterworth church. Source: “Pictures and Royal Portraits illustrative of English and Scottish History. From the introduction of Christianity to the Present time.” Author: Thomas Archer. Published in London, 1878 by Blackie & Son. This entry was posted in 14th Century, England, Genre, Middle Ages, Nobility and tagged Ecclesiastical Dress, English history, Medieval costume, Pictures and Royal Portraits on 5/11/15 by world4.